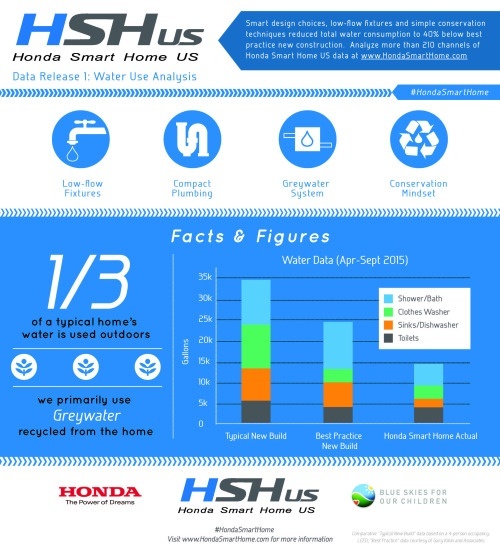 The Honda Smart Home, winner of a Green Home of the Year Award last year, is outperforming best estimates of its water-and energy-saving features. Designed for real-world monitoring of occupant behavior, the Honda Smart Home in Davis, Calif., just published its first 6 months of results--and they look even better than expected.The 1,945-sq. ft. home is getting even more attention now, as California continues to contend with severe drought. "Overall, water consumption was lower than expected, thanks largely to the thrifty water habits of our occupant family. We had expected to be slightly lower than industry 'best practice' consumption, due to the compact plumbing design we employed, as well as the low-flow fixtures used. But, in fact, for the first six months of data monitoring, we are 40% below the best practice estimate! To put this in perspective, the average American family of four uses 400 gallons of water per day, or 146,000 gallons per year, according to the EPA. Our occupant family is consuming only around 85 gallons per day!